"I’m Lori Kennedy from The Inbox Jaunt and my passion is free motion, machine quilting! I LOVE to create new designs and share them. I also LOVE to create pretty things to use in my house. 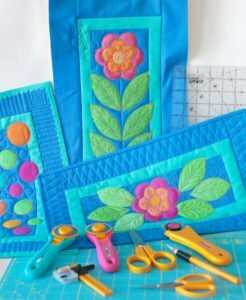 Free motion, raw edge applique is quick and easy with OLFA cutting supplies and it’s a great way to create small table runners or wall hangings. 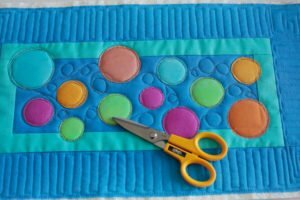 "Today’s project can easily be accomplished in an afternoon—but don’t be surprised if you find yourself burning the midnight oil creating a variety of compositions! Be sure to try out the OLFA Compass Cutter—it’s my new favorite tool!"